En savoir plus sur vos clients! Spotzi Style de consommateurs divise la population du monde en dix profils de consommateurs ou modes de vie. Ces profils ont été obtenus en analysant les habitudes des consommateurs et les données de recensement. Sur la base de ces données, les consommateurs sont classifiés en dix categories principales qui reflètent la valeur et les préférences de ces consommateurs. *) Certains pays ne comportent que 9 catégories. Vérifiez les pays disponibles. Most people in this category are single and a higher proportion are schoolchildren and full-time students. They have a low income or no income. Despite having no income they might become the next generation with new and fresh ideas. 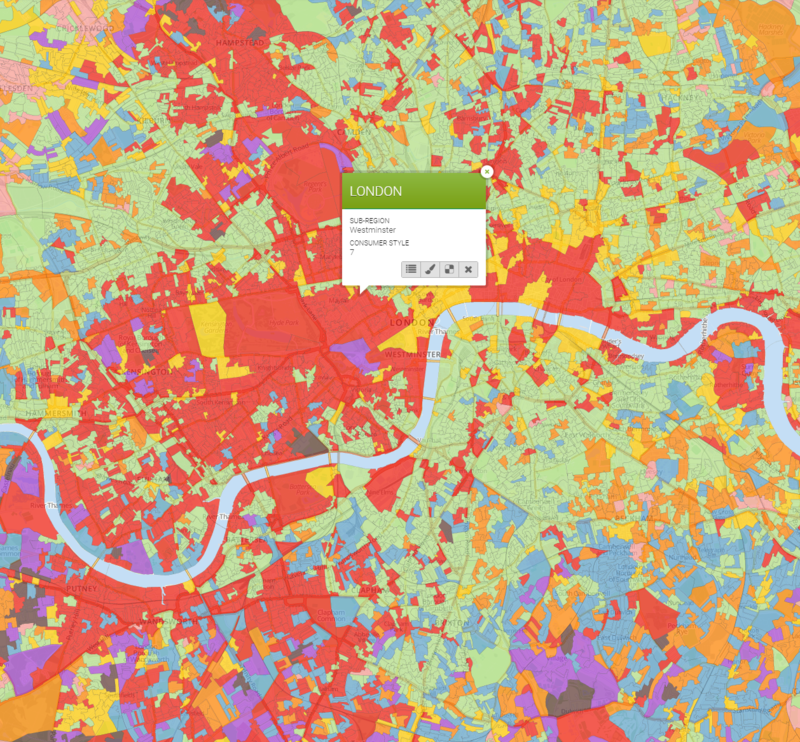 Households are more likely to live in terraced properties. They tend to more live in social rented accommodation compared with the national average. Many of them are absent from the labor market or work in the accommodation or food service activities industries. Mostly as a part time job. In this category ethnic groups are over representative but also a higher proportion of people are born in their home country from families with a low income. Households are more likely to live in a flat and to socially rent. This group can also be found in poor rural areas. There is a higher proportion of unemployed in the group but those in employment are more likely to work in the manufacturing industry, and to use private transport to travel to work. The income is below average however they can be found in the mall looking for best buys or just for window shopping. People in this category are most likely to be found in urban surroundings. Rates of divorce and separation are above national average. Households are more likely to have non-dependent children and to live in socially rented semi-detached or terraced properties. There is a smaller proportion of people with higher level qualifications, with rates of unemployment above the national average. Those in employment are more likely to be employed in the mining, manufacturing, energy, wholesale and retail, and transport related industries. The population in this category have no children or young children. A higher proportion of these households live in terraced properties or townhouses, and are more likely to live in privately rented accommodations. Car ownership is generally higher, and people are more likely to be employed in information and communication related industries. They are more likely to follow trends and buy new products. Despite their lower income they value a modern lifestyle with a generally higher consumer spending. The population in this category is most likely to be located on the outskirts of urban areas. They are more likely to be home owners and to live in semi-detached or detached properties. The population mostly consists of young and middle aged parents with school age children. Marriages or civil-partnerships are above the national average. Individuals are likely to have higher-level qualifications than the national average, with the levels of unemployment in these areas being below the national average. People are more likely to work in the information and communication, financial, public or education sectors. They use private transport to commute. Households are more likely to live in detached and semi-detached properties, and to be home owners. A higher proportion of households have two or more cars, unemployment is lower, and workers are more likely to work in the Information and communication, and financial related industries. This group differentiates themselves from Nest Builders as they are likely to have a managerial position and they have a higher income. They therefore have more money to spend. Levels of unemployment in these areas are significantly below the national average. This group more likely spends their money on Information Technology products and follow new trends. People in this category can be found in the expensive urban areas and have no children. They spend their money on luxury goods. They have a car however they don’t use their car to commute as they work and live downtown in luxury apartments. Their education and income is above average. Affluent Immigrants can also be found in this group. The age profile of this subgroup shows a higher proportion of people with older children or children that left the house. People are less likely to live in communal establishments. There is a higher proportion of households living in detached and semi-detached properties, and households owning their own property. Households are more likely to have two or more cars. There is a higher proportion of people working in the information and communication, and education related sectors. As they grew up from parents with a generally low income they spend but wisely. The people in this category are over 65 and can be found in both urban and rural areas. The share of retirees is the highest in this category. This category is a mixture of affluential seniors and seniors with a modest income. Regarding the type of housing apartments is the dominant category amongst this group. Income equals the countries average. The population of this group live in rural areas that are far less densely populated compared with elsewhere in the country. They will tend to live in large detached properties which they own and work in the agriculture, forestry and fishing industries. The level of unemployment in these areas is below the national average. Each household is likely to have multiple motor vehicles, and these will be the preferred method of transport to their places of work. The population tends to be older. The geodemographic classification created by Spotzi is based on microdata from Census Offices all over the world, Eurostat and local data partners. Strongly correlated variables were removed to avoid the duplication of particular factors. This finally resulted in 10 main groups. These main groups represent the median demographic composition of the World. Some countries like the UK and Canada have a strong Ethnic diversity. The Office for National Statistics as well as the Census Office in the Netherlands create groups based on their Ethnic background. Spotzi however looked at the housing preferences and Purchasing Power of the Ethnic groups and divided them accordingly. The names and descriptions are meant to provide greater insight than just examining the statistical outputs of cluster analysis alone. While they may not necessarily reflect the characteristics of the entire population, they are likely to represent the general characteristics for the majority of areas assigned to specific clusters. Number of inhabitants and households within a given region, provided in absolute and per mill values. At Postal Code Level by each of the 10 consumer style groups, the number of people and the percentage of people and index. At Municipality Level by each of the 10 consumer style groups, the number of people and the percentage of people and index. At Small Area Level the predominant consumer style. Unlock the potential of our Purchasing Power data of 17 food and non-food product lines. An ideal dataset for enriching your customer database or mapping out new potential customers. Discover trends in dwelling prices and act at the right time. Buy or sell land or properties based on insights created with our data. Spotzi has postal code boundary maps of more than 30 countries in its data store. Easily segment your potential customers based on a postal code area and combine this with for instance our Consumer Styles.